Here’s a great easy magic trick and all you need is a length of rope to perform it. The effect is quite baffling, and the “magic” occurs in the blink of an eye. You create an “eye of a needle” with a piece of rope and tell spectators that you will be able to quickly “thread” the “eye” with the other end. In fact, you'll accomplish this so quickly that you won’t even let go of the rope and spectators won’t see it occur. In a fraction of a second, you thread the needle, and no could see it happen. If you would like to watch a video of the trick, you can do so here. A length of rope about two to three feet in length should work. You may have to experiment to determine the length that works best for you. Also, almost any type of rope should work, just as long as it’s not too stiff. Turn the page to learn the secret and how to set up the trick. This effect requires no sleight of hand and no previous knowledge. This is a great piece of impromptu magic that can be performed at any time, and anywhere you have a spoon. It's a good one to have in your mental toolkit of tricks that you can do. You set up the rope in such a way that by simply moving the end past the “eye of the needle,” you “thread” the rope. The rope actually removes a coil from your thumb and slips the rope into the “eye” from underneath. This will make more sense as you work through the instructions. Drape the rope over your left hand as shown in the picture. You’ll want the majority of the rope to be dangling to the right over your fingers. And you’ll want about a foot of length to dangling below your hand to the left. Note that all of the images in the instructions here are from the viewpoint of the performer, or your viewpoint. If you are left-handed or prefer to perform the trick using the other hand, simply reverse the directions given here. Wrap the long end of the rope around your left thumb three or four times. 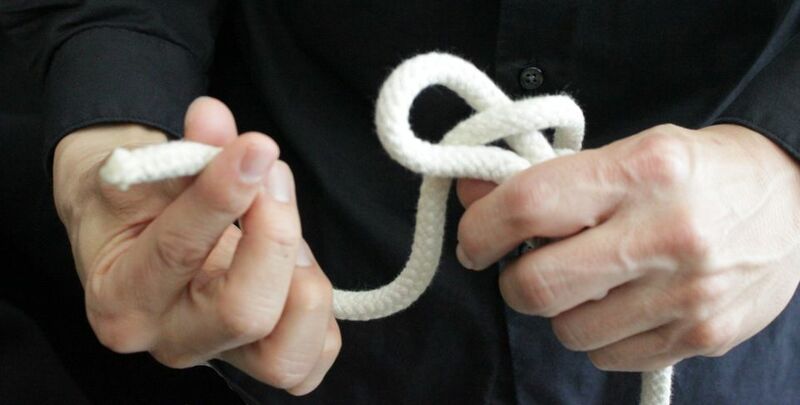 Looking at the tip of your thumb from the top, you’ll be wrapping the rope in a counter-clockwise direction. This is important. If you wrap the rope in the wrong direction, the trick won’t work. You’re ready to perform the trick. Go to the next page to learn how to execute this fast mind bender. When practicing, it’s best to do this slowly till you get the hang of things. Of course, in a real performance, you’ll want to do this quickly, so the “needle” appears to instantaneously be threaded. This is a fast effect that can be combined with other rope magic. In the grand scheme of things, this is probably more of a bit or gag that one can perform before moving on to other rope magic tricks. Is this a penetration effect or a fast “threading of the rope?” It’s actually up to you and depends on how you want to present or “sell” it. You can tell spectators that you will mysteriously cause the end of the rope to mysteriously pass through the “eye” of the rope that you have created. In this case, you’ll be presenting this as a penetration effect - one where two pieces of rope appear to pass through each other.